Heat oven to 375°F. In medium bowl, stir cookie mix, butter and egg until soft dough forms. On lightly floured surface, roll dough to 1/4-inch thickness. 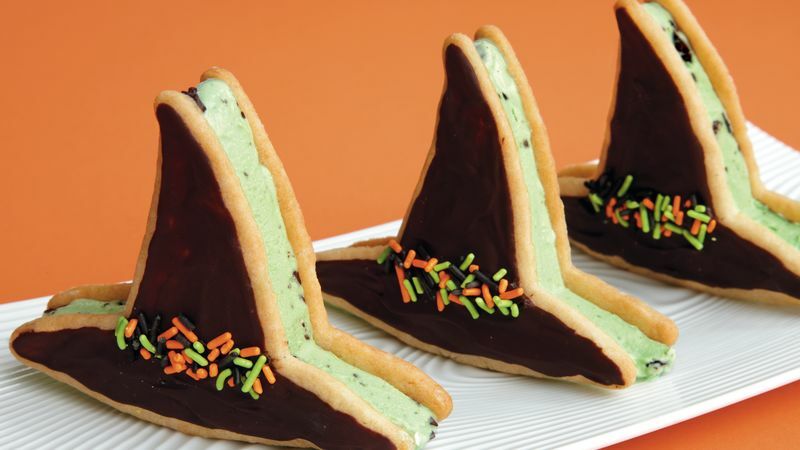 Cut with 3- or 4-inch witch hat-shaped cookie cutter. On ungreased baking sheet, place cutouts 1 inch apart. Bake 9 to 11 minutes or until edges are light golden brown. Cool 2 minutes; remove from baking sheets to cooling racks. Cool completely, about 30 minutes. For each ice cream sandwich, press about 1/4 cup ice cream between 2 cookies. Wrap individually in plastic wrap. Freeze until firm, about 1 hour, or until serving time. Melt molding wafers as directed on package; brush over one side of each ice cream sandwich. Decorate with sprinkles. Freeze until set. Tip This treat can be made with any of your favourite flavours of Betty Crocker® cookie mixes or ice creams. Try using peanut butter cookie mix and peanut butter cup ice cream.